Support Connection, Inc. announces the next session of their free monthly program “Mahjong, Coffee and Camaraderie.” It will take place on Thurs., May 16, from 10-11:30 am at the Support Connection office in Yorktown Heights, NY. Open to people living with breast, ovarian and gynecological cancers. To learn more or to pre-register (PRE-REGISTRATION IS REQUIRED) call Support Connection at 914-962-6402 or 800-532-4290. 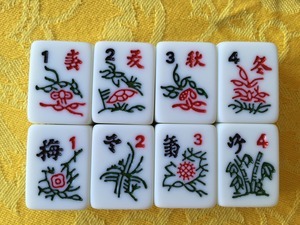 Mahjong is an ancient game enjoyed by many fans over many centuries. Camaraderie is a mutual trust and friendship among people who spend time with each other. Together they make a perfect match! Open to mahjong players of all levels, beginners also welcome. Share your love of the game with fellow enthusiasts while enjoying the company of others who are also living with cancer. A Support Connection Peer Counselor will be on hand as well. Coffee, tea and light refreshments will be served.